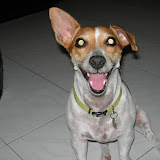 Ahh.. My human has just gotten word that there will be an exciting doggy day soon!! I don’t think I’ll be able to come as the humans have some important event then… You doggies have fun, ok? ?